Some of the most contentious issues in American politics are the growing gap between rich and poor, the cause of such inequality and what to do about it. Republicans and Democrats have sharply differing views on the topic. Federal Reserve Chair Janet Yellen put inequality back in the news last week when she addressed the subject in a speech. Not quite half (46%) of the American public sees the gap between the rich and the poor in the United States as a very big problem for the country, according to a Pew Research Center survey. Another 32% regard it as a moderately big problem, while 20% say it’s a small problem or no problem at all. But those overall numbers mask an ideological divide. Fully 59% of Democrats voice the view that inequality is a major national economic challenge, as do 49% of independents. But only 19% of Republicans agree. There is also partisan disagreement on the most important reasons for the gap between the rich and the poor. Republicans (39%) are most likely to say it exists because some people work harder than others. 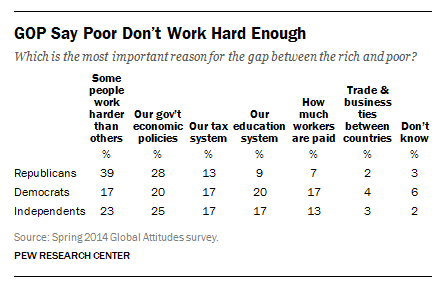 Democrats (17%) and independents (23%) are much less likely to blame the poor’s work ethic. Republicans (28%) also say inequality is a product of government economic policies, a view held by 24% of Americans overall. Democrats (20%) and independents (25%) are less likely to point the finger at government, putting more emphasis on shortcomings of the U.S. education system. A fifth of Democrats and 17% of independents (17%) cite the educational system as the most important reason for the rich-poor gap compared with just 9% of Republicans. Republicans and Democrats also strongly disagree on the role of taxes in addressing the gap between the rich and the poor. About seven-in-ten Republicans (71%) favor a policy of low taxes on the wealthy and corporations to encourage investment and economic growth as a means of reducing inequality. The same number of Democrats (71%) back high taxes on the rich and companies to support programs that help the poor. 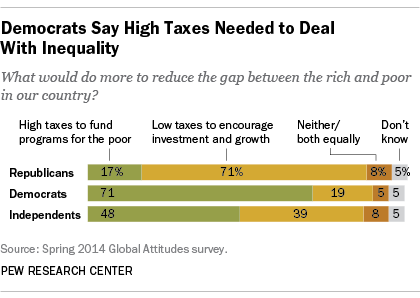 A plurality of independents (48%) also favor high taxes.